Today I bring to you a little “Chalktalk Lesson” on Portieux Vallerysthal sizing. Certainly in my time as an online seller, I have gotten those messages where people asked to return an item because the sizing was unexpeted..ly..small. I completely understand. The cost of PV is not like a trip to Crate and Barrel (although my dream one day is to stock enough PV that it would be). So in order to avoid the whole awkward glass doesn’t hold the copious amounts of wine you willed them too, I thought I’d explain the Portieux Vallerysthal glasses sizing in greater detail. On my travels the other day I came across this beautiful chalkboard with a gilded frame (for $5...) A trip to Starbucks would cost more! Later in the day as I'm setting up my Portieux Vallerysthal for a little photo shoot, I realized how cool they looked in front of the chalkboard and wondered what fun I could have with it. Then I realized this might just be the best way to show you the PV sizing all in one place. I didn’t want to just stick a piece of fruit, coke bottle, or quarter next to the lovely blue opaline glasses as your point of reference (online sellers can probably appreciate that!!). I wanted to show you how they compare to their counterparts. Hopefully this helps you figure out what Portieux Vallerysthal Glass suits your needs best. 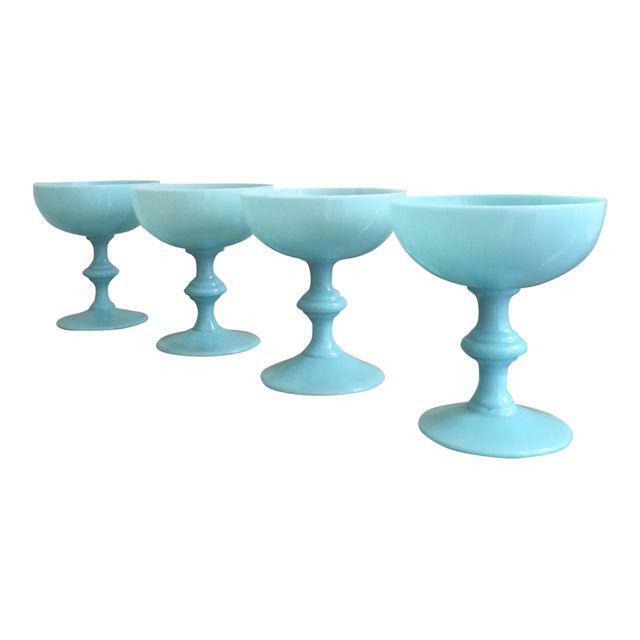 One little beauty who didn't make feature is the ever popular champagne glass (or coupe). These stand about 4.75" H and hold 4oz. Of course, there are many other odd-ball sizes I have not mentioned that are extremely difficult to find, especially as a set. However you can always mix and match because one thing that will remain consistent is the beautiful blue hue of the Portieux Vallerysthal. Why Thank You so much!! !